Huperzine-A is a natural alkaloid extract of Huperzia serrata, a Chinese plant. It has been used for centuries in traditional Chinese medicine for treating senile dementia. ¤ Huperzine was isolated for the first time in 1948 by Chinese scientists. The majority of clinical studies have been conducted in China where huperzine now has drug status and is used to treat Alzheimer's disease and other age-related memory disorders. ¤ In the United States, researchers from the University of Georgetown announced a new clinical trial in June 2006. Involving 150 patients with mild to moderate Alzheimer's disease, the objective is to test the efficacy of huperzine-A. ¤ Just like certain drugs, huperzine-A inhibits the enzyme acetylcholinesterase which breaks down acetylcholine, a neurotransmitter essential for optimal cognitive function. The amount of acetylcholine available in the brain is therefore greater. Unlike drugs, huperzine-A does not create dependency and is therefore suitable for long-term use. It also has longer-lasting action, is absorbed faster, crosses the blood-brain barrier more quickly, has few or no side-effects and does not produce liver toxicity. 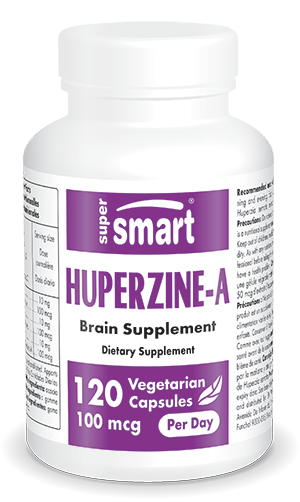 Taking huperzine-A leads to significant improvements in memory, concentration and learning capacity. Research has also shown that huperzine-A substantially reduced abnormally high radical activity both in the brains of elderly animals as well as in the blood of Alzheimer's patients. In monkeys, it reversed scopolamine-induced amnesia suggesting that it may benefit the cognitive problems of Alzheimer's patients or those with other cognitive disorders. ¤ Huperzine-A's unique properties make it a potential treatment for a number of age-related cognitive deficits. Healthy individuals may choose to take a reduced dose for preventive purposes or to improve their cognitive performance. Each vegetarian capsule contains 5 mg of Huperzia serrata extract standardised to 1% huperzine-A. Take one vegetarian capsules morning and evening or as advised by your therapist.